Reconnaissance Design Institute. of projects. One of these projects encompassed current mea- surements for a new port in the vicinity of Caofeidian District, in Hebei, China. “Our customer needed site-speci? c raw data of currents, waves, depth, turbidity, etc. for a new port in Caofeidian. Their purpose was to use the data to build a mathematical model for the port area. This was very important for the engineering work in connection with the construction of the new port and adjacent buildings,” said Wang. His team selected two measurement sites according to their customer’s technical requirements. “We surveyed along these two sites back and forth in several rounds to obtain complete datasets of the whole tidal process in the area. 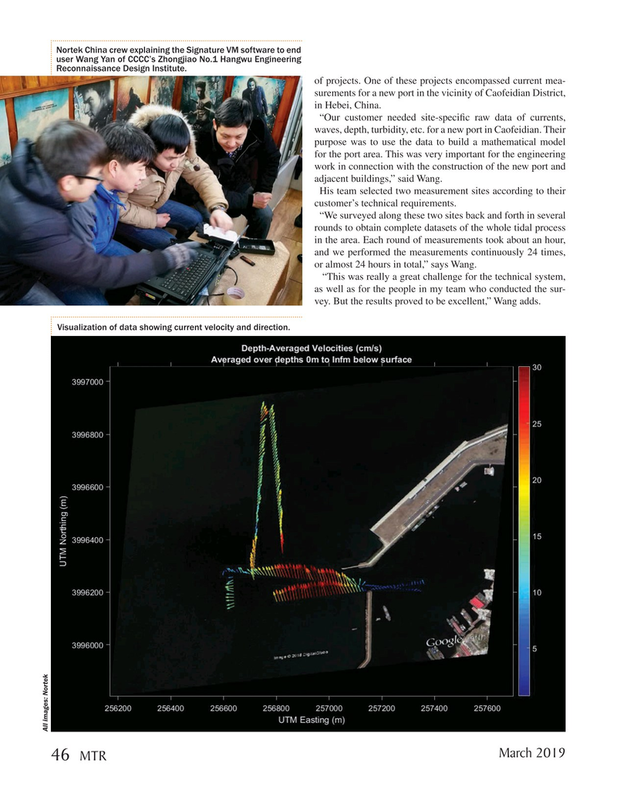 Each round of measurements took about an hour, and we performed the measurements continuously 24 times, or almost 24 hours in total,” says Wang. “This was really a great challenge for the technical system, as well as for the people in my team who conducted the sur- vey. But the results proved to be excellent,” Wang adds. Visualization of data showing current velocity and direction.